The cartoon below is from Hugh MacLeod and is a nice New Year’s reminder to live in the moment but with a long-term plan in mind. 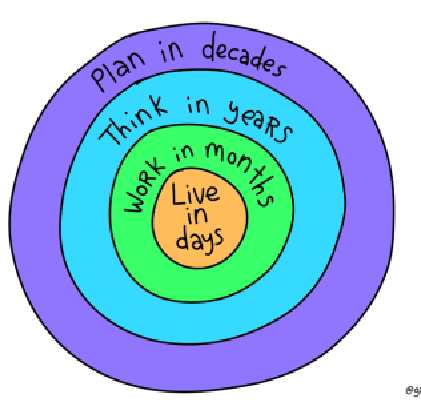 When planning for the long-term THINK BIG as most people underestimate the changes that can occur over a 10-year time period. Just look back over the last 10 years and think about all of the changes you have experienced. Now, think about all the positive changes that can occur over the next ten years—and write them down. However, don’t think in terms of numbers or checklist goals. Instead think about what your Ultimate Emotional Outcome (UEO) could be. For example, perhaps your UEO is to live with a feeling of financial security. Make this outcome emotionally powerful by taking time to imagine how it will feel to be financially secure. Image how your life is in 10 years with total financial security. Where are you living? Who are you surrounded by? What do you do each day? Focus on how this feels. Make this a fun and enjoyable process getting in touch with what is most important to you. Now, create an image (or find an actual image) that represents your UEO. Look at this picture in your mind each day adding another detail. Vivid images are more powerful and motivating. This should not be an intellectual exercise, but an emotional one. This is done by focusing on the feelings associated with your UEO. Once you have your UEO, write down what it is and WHY it is so important to you. Why is this a must in your life? Now with a UEO, and a WHY, you have the proper motivation and context to begin to develop annual and monthlyGOALS. Goals are not fixed, but must be constantly set, changed, and renewed. Goals are tools to keep us moving in the right direction and to fill us with a sense of purpose and accomplishment. In our example, this may be an annual or monthly savings goal. Share these goals with an “accountability buddy” such as your spouse or a friend, mentor, or coach.